Michael Nyman claims to have coined the term "Minimal" to describe the musical genre which began in the USA in the 1960s and has grown to become one of the more potent forces in contemporary music. Whether he was the inventor of the term or not I cannot say, but whoever first thought it up, it is the ideal word. And while it is now far from being simply a clever use of overlapping harmonic and rhythmic cells - Minimal Music has grown to encompass complete operas – it still has at its heart a small cell which generates considerable expansion. Minimalism seems set to be a major driving force in the development of art music. I can confidently lay claim to having coined a term for another musical genre which originated in America during the latter half of the 20th century. It's a genre which isn't going anywhere and seems destined for a sterile life of its own, detached from other developments in the wider musical world. Yet, as Gabriel Crouch has written, "choral libraries up and down the USA are stuffed full" with it and "music publishers will freely acknowledge that this vast body of work keeps their businesses flourishing". And what is this hugely popular and commercially successful genre which, until now, hasn't had its own label? Unaccompanied American choral music. 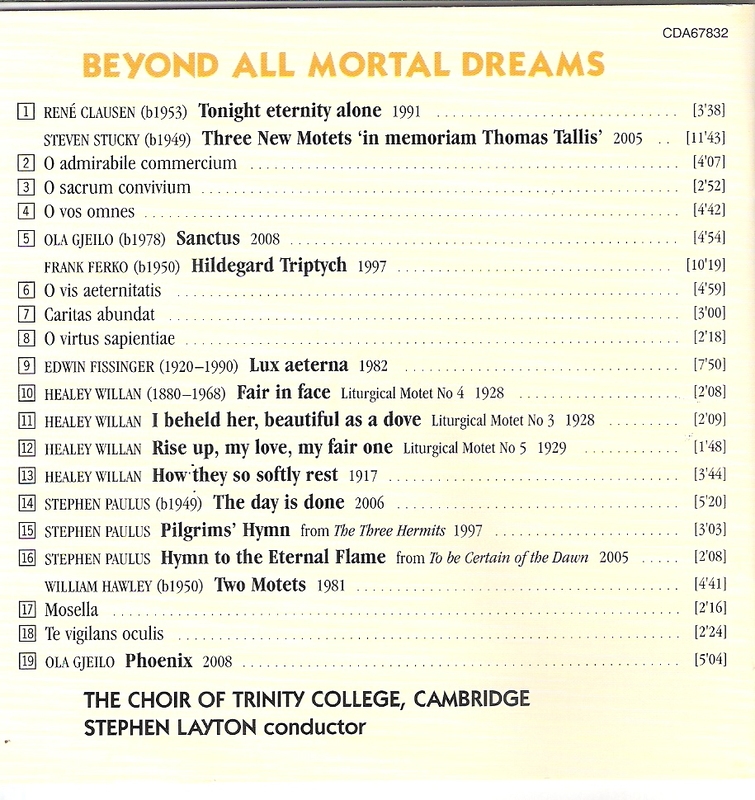 Listening to the latest CD of it – "Beyond All Mortal Dreams" performed by the Choir of Trinity College Cambridge under Stephen Layton on the Hyperion label (CDA67832) – it suddenly struck me that I was listening to the aural equivalent of one of those large glass domes which revolve at discos (and, in a moment of utter farce during a recent staging of Carmen in Singapore, one dropped down, flashed around a bit, and then disappeared again rather in the manner of a pop diva's "wardrobe malfunction"), or the once-popular child's plaything, the Spyrograph. (I used to be addicted to that. Where are they now? It was a piece of moulded plastic with a circle cut out of the middle with teeth around the outside into which you placed a small perforated wheel. You stuck your pen into one of the holes in the wheel and drove it round in circles over a bit of paper, producing an amazing array of patterns.) What both the disco ball and the Spyrograph had in common was that they remained virtually static but created an impression of great movement and beauty. Which is exactly what so much unaccompanied American choral music does, hence my new word for it; Stasisism. It doesn't go anywhere, is ultimately sterile and, unlike Minimalism, I can't see it moving outside the rarefied world of a cappella choirs. But, within its limited and introspective world, it certainly creates moments of great beauty. At its heart seems to be the use of one or two unequivocally tonal chords, which are sustained for most of the work, the impression of movement coming from the subtle shifting around of the voices within the chords and the projecting above this of solo lines which move tantalizingly away only to drop delicately back to the home chords. The aural effect is of a luminous, almost hypnotic beauty, shimmering and floating, adding sparkle and intricate patterns around the chords, but never actually moving on from them. Such music has been the mainstay of Unaccompanied American Choral Music for the past half-century and has thrown up its own great heroes, not all of whom are American but who nevertheless feed the apparently insatiable appetites of American choirs. 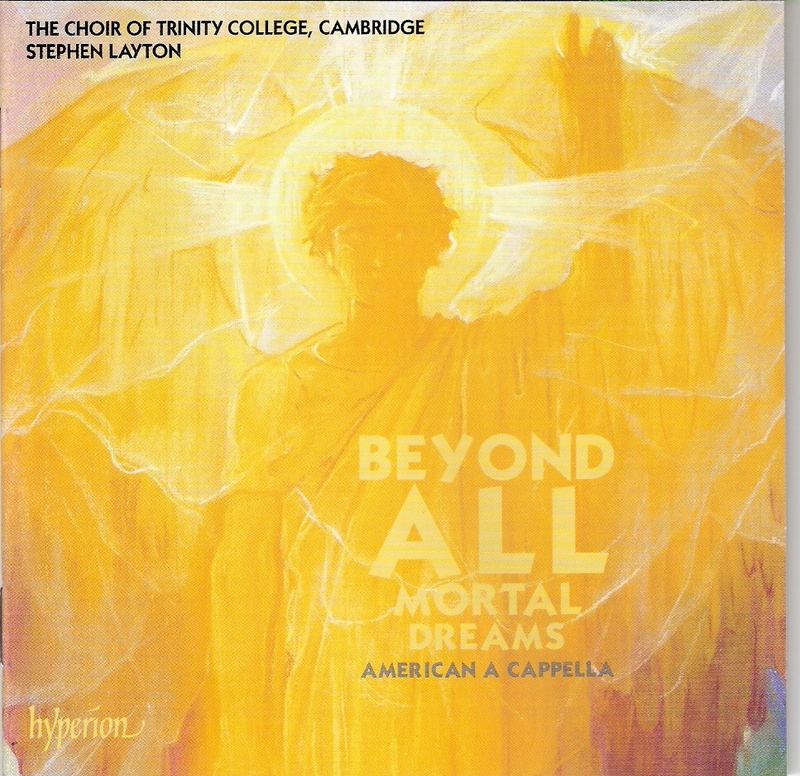 There's Morten Lauridsen, Eric Whitacre, Stephen Paulus, and dozens more, while the Hyperion disc brings to my attention René Clausen (whose Tonight eternity alone is a classic piece of Stasisism), Edwin Fissinger, Ola Gjeilo and William Hawley (who seems to be a Stasisism master, if his two Motets are anything to go by). My review of the Hyperion disc will appear in Gramophone in the next couple of months. Suffice it to say that, while the music is, for me at least, superficially attractive but ultimately unsatisfying (like eating Marzipan fruit), you will not hear it performed better than by Stephen Layton's choir. So many American choral directors like to dig around for something "meaningful" or "significant" in this sort of thing, but Layton recognises that Stasisism has no such depth, that what you hear is what you get, so we all may as well enjoy the moment while it's there for, like our pop diva's "wardrobe malfunction", it gets buttoned back up again after a few minutes.